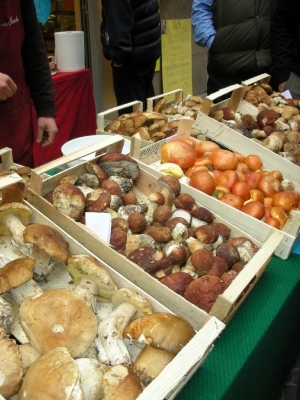 Fall is here and towns all over Italy are celebrating local products and seasonal fare. Visitors to Italy can find food festivals throughout the country, celebrating autumn’s bounties such as truffles, mushrooms, chestnuts, and chocolate. With grape harvests finishing up and olive season underway, this time of year is a food lover’s delight. This year’s olive harvest started a few weeks earlier than usual, due to the unseasonably hot summer. The good news is the wait for fresh olive oil is over! In addition to many small local festivals, Slow Food’s International Food Event is held every other year in October, while World Pasta Day is the fourth Sunday in October. This year marks an important year for Italy and their reverence for food, with Milan being chosen for the site of Expo 2015 “Feeding the Planet, Energy for Life.” The world fair will close its doors on October 31, after a six month run. Visitors and locals alike are planning last minute visits to visit the global food exhibition before it shuts down. Even with the Expo in Milan ending its run, there are plenty of other food celebrations to enjoy all over Italy. From October 10-November 15, 2015, the International Alba White Truffle Fair will be held in Alba, in the northern region of Piedmont. This area is one of the largest producers of precious white truffles. The month long celebration will feature various events including educational seminars, wine tastings, banquets, medieval reenactments, and musical performances. In addition to chocolate, the traditional Italian dessert torrone is celebrated this time of year in the town of Cremona. Cremona claims to be the birthplace of torrone, with a historical document from October 25, 1441 stating that torrone was made for a wedding banquet in the town. On October 24-25 and November 21-29, the historical wedding will be re-enacted, along with pageants, processions, cultural event and tastings based on the traditional sweet made from egg whites, honey and almonds. From local products to international food expos, Italy takes food seriously. One of the world’s largest food festivals, Slow Food’s International culinary event “Salone del Gusto & Terra Madre” is held every two years in Torino. Held in even years (2012, 2014, 2016, 2018, etc), the next “Olympics of Food” will take place in October 2016. Official delegates from over 100 countries will gather to present the very best of what their country’s food systems have to offer. Slow Food’s philosophy is a commitment to preserve the integrity of a food’s origin, taste, and honored preparation. The movement encourages the use of products from local ecosystems, and embraces the traditions of small, independent culinary artisans. In addition to these planned events, you will often see small towns in Italy offering weekly farmer’s markets showcasing local agriculture and artisanal food producers. Our mouth is watering just thinking about the possibilities!